We’ll give you a hint: It’s nowhere near being new. Have you ever heard of an Enfield 8000? Chances are that unless you were born in the 1960s and lived in the United Kingdom throughout your younger years, you probably don’t. The Enfield 8000 was a battery-powered electric car that was produced by Enfield Automotive between 1973 and 1977. That’s right; the U.K. had a battery-powered car more than 40 years ago. Pretty wild right? Well, this story is about to get even wilder and, to be honest, a little crazy. How crazy you ask? So crazy that one of these mid-1970s Enfield 8000s has officially become the world’s fastest street-legal electric vehicle. If that’s not crazy enough for you, what if I told you this little British EV put a beat down on the Lamborghini Aventador, McLaren 650S, Porsche 911 Turbo S, the Nissan GT-R, and even Tesla’s Model S P90D. I’m sure you don’t believe me, but that display image you see above – that’s the time slip proving that this car is no joke. As you can see, the car – which goes by the name “Flux Capacitor” – made a number of runs, but its last one was the most important. It was able to travel 330 feet in 4.02 seconds and hit an eighth-mile in just 6.15 seconds at 113 mph. The whole quarter mile sprint took 9.86 seconds with a speed of 121.73 mph, and it did it all on battery power without any exterior aerodynamic enhancements. Enfield Automotive, which was owned by a Greek millionaire named Giannis Goulandris, built the Enfield 8000 as a response to the oil crisis of the 1970s. It was supported by a tubular chassis frame and had aluminum body panels. And, to be quite honest, it was kind of a mutt. Most of its suspension system came from the Hillman Imp, while the doors came from Mini and the rear axle was borrowed from Reliant’s three wheeler. The car was powered by lead-acid batteries and had an eight horsepower electric motor. As you can imagine, this thing was a complete turd, with top speed coming in around 48 mph. It did have a range of around 40 miles, which really pretty crazy considering some of the best plug-in hybrid models available today have less than 40 miles of all-electric range, and they have efficient lithium-ion battery packs in tow. Anyway, as the story goes, the initial production run gave birth to just 120 cars – 65 of which were used by England’s Electricity Council as fleet vehicles. Enfield was later merged with Green Neorion, and production of the 8000 was moved to a new location where nearly 100 more examples were built. So how did a car that originally had lead-acid batteries and an eight-horsepower motor pull a nine-second quarter mile? Four years ago, Jonny Smith acquired the car which, at the time, was written off for flood damage. From that point on, Smith began to restore the vehicle while adding a bit of modernization. The exterior is bone stock, and hasn’t be altered in any way, but under the skin you can find 188 lithium-ion battery cells, and two nine-inch electric motors at the rear axle. The battery pack produces 2,000 amps and 400 volts. If that sounds like a lot, that’s because it is. The two electric motors manage to put more than 800 horsepower and 1,200 pound-feet of torque to the pavement. I promise, that’s no typo. 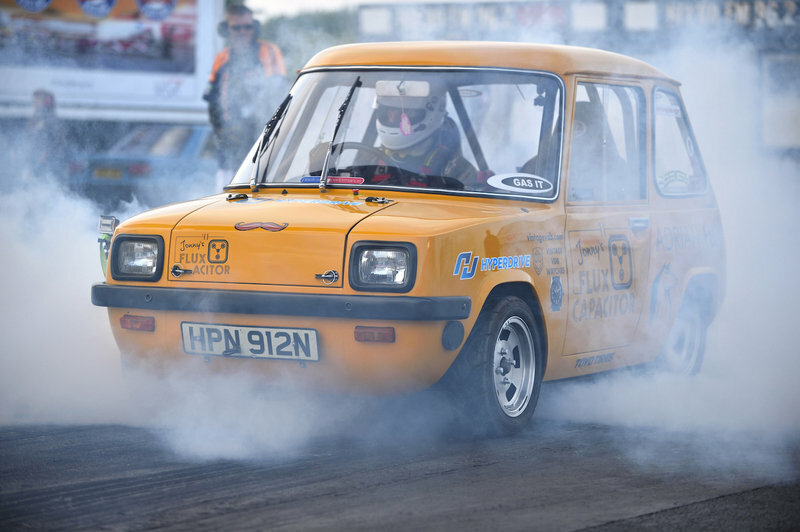 A tiny British electric vehicle from the 1970s has become the world’s quickest street legal EV in the hands of motoring journalist and serial car modifier Jonny Smith. 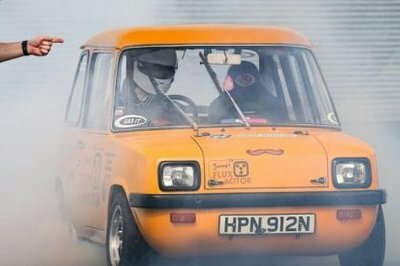 The Enfield 8000, a forgotten city car built on the Isle of Wight in the oil crisis era, stormed through the quarter mile sprint at Santa Pod on Saturday in a record-smashing 9.86 seconds at an average 121mph. Originally boasting just 8hp, the car dubbed the Flux Capacitor now packs more than 800bhp, 1,200lbft of torque and quietly rockets to 113mph in six seconds. To put that in perspective, it outpaces modern supercars like the Lamborghini Aventador, McLaren’s 650S, a Porsche 911 Turbo S, Nissan GT-R and even Tesla’s incredibly capable P90D electric car. Jonny snatched the world record, which stood at 10.25 seconds, from the car that inspired him in the first place - an electric converted old Datsun owned by John Wayland from Portland, Oregon. “I’m in awe of what this little yellow thing can cope with,” said Jonny, who has presented TV’s Fifth Gear since 2006 and approached Adrian Flux to sponsor his dream four years ago. “Despite so many racers telling me that a 68-inch wheelbase car could never safely go as fast as we wanted, the Enfield has proved them wrong. “Originally the car was designed to drive up to speeds of 40mph. Now it triples the speed within quarter of a mile without any aerodynamic alterations – which is testament to the original design. “The original designer John Ackroyd, who spent a lot of budget on the aerodynamics, and went on to work with Richard Noble on Thrust 2. “The car never feels like it is out of its comfort zone. To be honest I have disconnected the speedo, and just drive it by feel. You quickly forget how small it is when the lights go green. The instant electric torque delivery is something I have never experienced in over 15 years of driving and testing sports cars. “I set out to build a British electric hot rod. I hope I’ve achieved something leftfield enough to prove that David certainly can beat Goliath. Jonny rescued the Enfield, then a flood-damaged write-off, four years ago, and restored the car before adding 21st century electric technology. The car is powered by 188 lithium-ion battery cells built into enclosures under the bonnet and boot, generating 2000 amps and 400 volts to a pair of DC 9-inch motors to drive the back wheels. These batteries are normally seen running the miniguns and starting the engines of a Bell Super Cobra attack helicopter, but built for the car by Hyperdrive Innovations in Sunderland. Despite reaching 100mph in under 6 seconds and only being 112" (2.8 metres) long, Jonny’s Enfield is still road legal, tax exempt and London congestion charge exempt. As part of the drag racing series he competes in, the Street Eliminator entrants must prove their roadworthiness as part of the qualifying process by way of a mandatory 26-mile cruise around Northamptonshire. Being road legal means the car has to run treaded tyres, and no wheelie bars, which might help the 68" (1.7 metre) wheelbase to stay straight under full acceleration. But even without them, the Flux Capacitor runs straight and true - and very, very fast. Read more about the Flux Capacitor here.